If you’re like me, working with your hands is a little therapeutic, and I really enjoy taking on small woodworking projects (like this cribbage board). 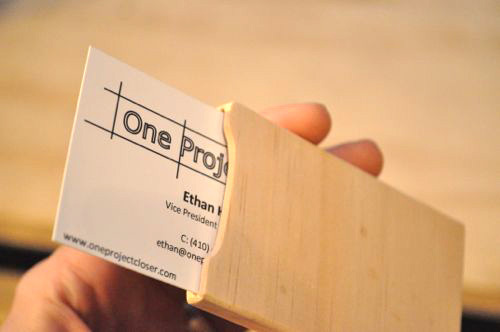 My hope is that as time goes on, I’ll use fewer and fewer power tools so while I’ve already completed this business card case, I plan on making another. Heck, I might even splurge on some nicer wood. 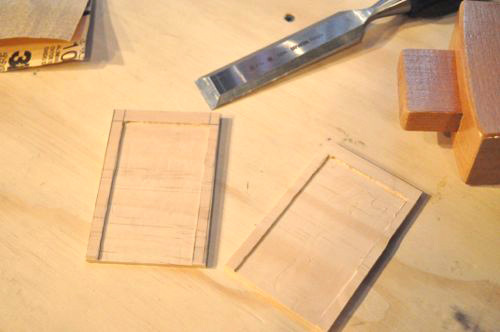 Until then, here’s how I made a slim, wooden business card case. Like many of my woodworking projects, I started with a piece of scrap pine. 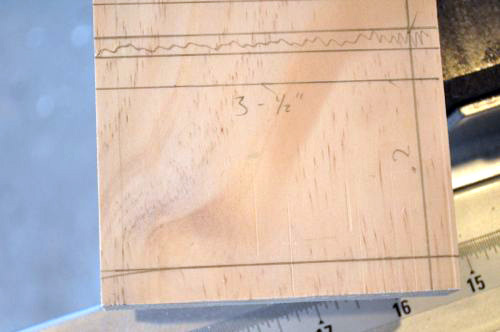 Most business cards, including mine, measure about 3″ x 2-1/2″ so I marked out two of those on the piece of pine. 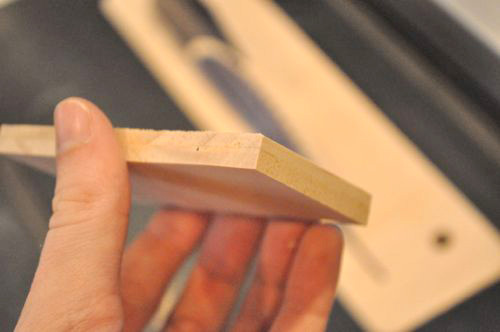 Next, I used the table saw to rip the board down to about 3/8″ thick. The plan is to carve out a small depression on each side and then sandwich them together to form a slot for carrying business cards. 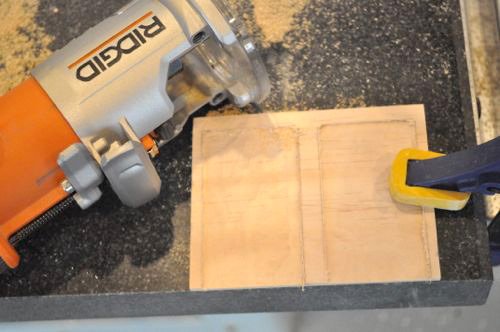 I set my palm router to a shallow depth and cut away most of the wood. I followed that up with a chisel to clean up the edges and corners and ensure I had enough room to slide cards in and out. Ultimately, it doesn’t need to look too pretty because no-one will ever see the inside. I glued and clamped the two side together and let the glue dry. 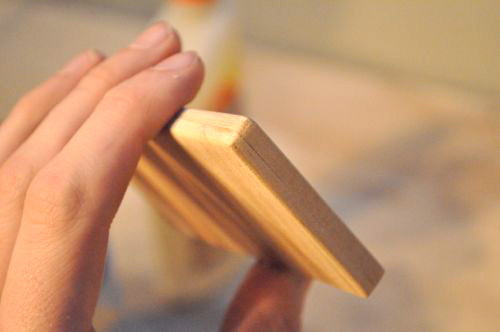 Next, I used my table saw to cut all the outside edges perfectly even. I sanded all the corners slightly and used a Dremel attachment to sand down one side and make it easier to pull out a card. Some glue oozed inside so I fished that out with a jigsaw blade. All that’s left is finishing the wood with a stain and / or urethane. I’ll probably hold off since I’m already planning on making another (nicer) one. Interesting – I wasn’t expecting this, when I saw the title I was expecting a desk top business card holder. Any plans to make one of those to match? That might be the next odd project I tackle. Thanks for the idea. Cool! How many cards does it hold? It’s too bad teachers don’t need business cards or I’d be making one of these! Mine is too tight so it doesn’t hold very many cards. I plan on cutting the next one deeper. Nice project. Different, but appropriate for OPC business cards for sure. By the way, which tablesaw is that! Is that a granite top, what do you use on it? Wax, sealer? I have a rigid 4511. I have had it for a year and I love it. I have done nothing to the granite tables, though, and I intend to apply a finish, but haven’t decided what to use yet. Any suggestions? Great newsletter. Keep those projects coming! Hi Matt, looks like Ethan missed your question so I’ll grab it – so far we haven’t done anything to seal the granite, and frankly I’m not sure we knew we should be worried about it. So far it looks just like the day we installed it. I hadn’t planned on sealing it. I’m pretty good about not using the TS for paint or anything like that, especially with all the workbenches available so it should stay looking nice. I may consider a wax to make it easier to feed stock through it. Thanks for the comment! Interesting little side project. 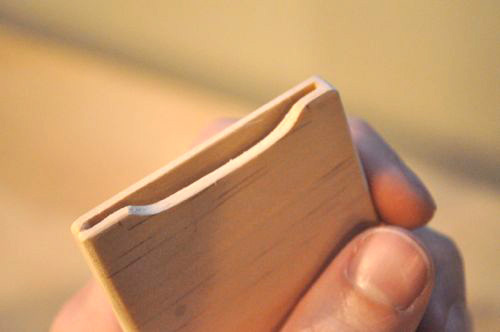 After mastering the business card holder, you ought to try your hand at making a wooden phone case. Imagine how unique a nicely stained iPhone case would look! I’ve seen them for sale online, but they’re insanely expensive. I always thought about trying to make one myself, but never actually got around to it. They are really expensive…. A phone case would be sweet but also a lot of work. That’s a project where a laser saw or some type of programmable cutting device would be more appropriate. You should use a wood burning pen to put the OPC logo or your initials on it before staining. I think that would look nice. 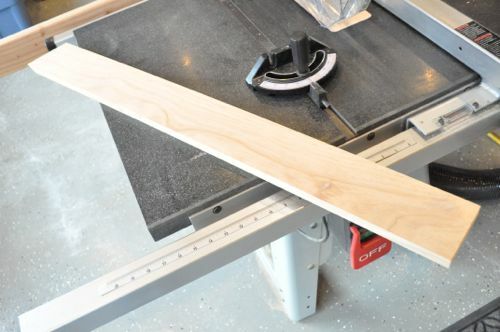 Wy would you want to use fewer and fewer power tools? 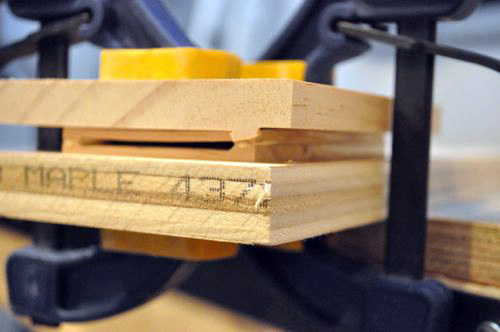 Ever used a well tuned hand plane? For me nothing is better in woodworking than making long curly shavings with a plane. I’ll never give up the table saw but hand tools are really relaxing. Interesting idea. I carry a money clip around with a pocket for cards and what not and have been thinking about replacing it with something a little more sturdy. Maybe this could work with some modifications to include a way to clip money to the front. 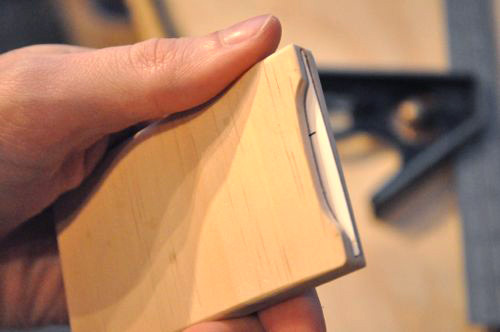 You could probably incorporate the money clip without too much trouble. Like I mention in the article, I used pine (not very pretty or strong) so if you’re looking for something more sturdy, pick a different wood. Thanks for the comment Kyle! A man my own heart — Sounds like a project to keep me busy until the snow clears. Trebor’s right by the way; burning the OPC logo on there would look cool. Ooo, I want one of these. I will have to bug my husband. Simple, functional, and personalized. Nice. Does Fred have a term limit as President? What’s his approval rating been running lately? How about a brief case? My boss once had one, it was beautiful. What a shame that you have used the ancient obsolete inches. How does any one in the modern world cope with that? You might as well have used cubits.